Like Leon Bosch, David Juritz came to the UK from Cape Town, winning a scholarship to study at the Royal College of Music with Hugh Bean and Jaroslav Vanecek. During his time at the RCM he won all the major prizes for violin including the college’s highest award, the Tagore Gold Medal. But he made national news with his 2007 project to busk his way around the world, paying for the 60,000 mile trip through 50 cities in 24 countries with the money he earned from playing Bach on the streets on a specially commissioned violin. He used the trip to launch Musequality, a charity supporting music education projects for disadvantaged children in developing countries. The journey meant a five month sabbatical from his role as leader of the London Mozart Players, a post he held from 1991 to 2010 (the longest serving leader in that orchestra’s history). He made many appearances as soloist and director with the LMP, including his debut at the 2006 Proms. He has directed the Royal Philharmonic, Zurich Chamber Orchestra and Mozart Festival Orchestras as well as many other ensembles, and has appeared as soloist with orchestras from London to Tokyo. Works written for him include a tango concerto by Cecilia McDowall (Tales of South America, later retitled Theatre of Tango), the composer whose earlier tango-inspired Not Just A Place was premiered by him and Bosch. David has made many recordings as soloist and chamber musician. His recording of the Vivaldi’s Four Seasons, re-released by Nimbus Alliance in 2012, has been widely hailed by critics as one of the finest interpretations of that much-recorded work. One of his 2013 highlights was leading the orchestra on the soundtrack for the film about Nelson Mandela, Long Walk to Freedom. 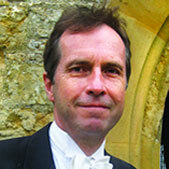 David has made many recordings as soloist and chamber musician. David plays on a violin made by JB Guadagnini in Piacenza in 1748.